When I began my Miami Fellows journey, I went into it with a mission: learn how I could use my skills and talents to bring about a better Miami. What I didn’t expect was the extent to which the Miami Fellows program would transform me and make me better. It was 2013. I was a young attorney who was six years into a healthcare law practice and owned an event marketing company called Social Esquire. I was satisfied and grateful with my portion in life, but I also knew that practicing law was not my true calling. My acceptance into the leadership program couldn’t have come at a better time. I joined Class VII, or ‘MF7’ as we affectionately called ourselves, with curiosity and optimistic energy. We were 16 emerging local leaders who came from different ethnic, cultural and professional backgrounds. Being surrounded by these brilliant minds was inspiring. They challenged my outlook on events happening both in Miami and around the country, and they forced me to dig deep and reflect on my personal beliefs. One Fellow who had a particularly profound impact on me was Frankie Ruiz, the chief running officer at Lifetime Fitness and founder of the Miami Marathon. Learning about the way he’d turned his passion into not only a lifestyle, but a business, inspired me to discover my own purpose. If Frankie could find his why, then I could find my why too. I was determined to step into my purpose. 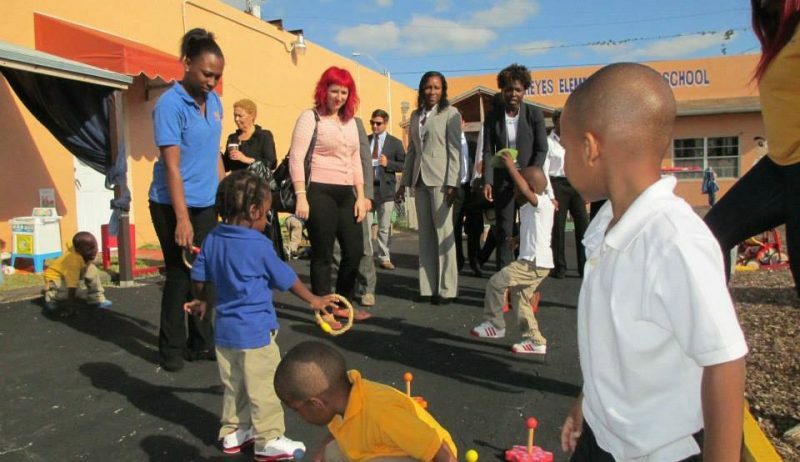 As we visited various locations around Miami, from Overtown to Homestead, Miami Gardens to Key Biscayne, I noticed how, despite their socioeconomic differences, each of these communities had one common underlying thread: the desire to live a happy and fulfilling life. The early childhood centers we visited were committed to giving toddlers the best chance at education so that they could grow up to have a happy and fulfilling life. Miami Waterkeeper was committed to solving rising sea levels so that residents could have access to a healthy living environment, which is essential to a happy and fulfilling life. If happiness was the common denominator, then the question was, “Am I committed to doing everything in my individual power to be happy?” If we could get the happiness equation resolved within our own lives, wouldn’t that then spill over into our families, businesses and communities? 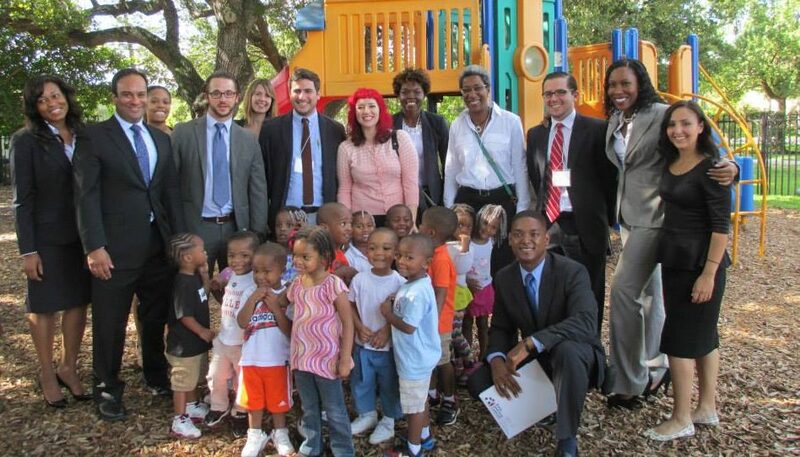 Pictured above: Rochelle Gapere and other members of Miami Fellows Class VII visit an early childhood learning center in Miami-Dade County. Happiness, I was good at. Happiness came naturally to me. I had a happy childhood filled with an abundance of love, affection and attention. As I grew older, life had its usual ups and downs, but for the most part, I had great perspective throughout, and happiness flowed in and out of my life pretty seamlessly. I found deep satisfaction in sharing how to do this with my loved ones through their own twists and turns as well. Happiness was my purpose. Helping others find their happy was my why. My time as a Fellow helped me commit to it. I became a happiness coach, completed a positive psychology program at the University of Pennsylvania and compiled all my happiness nuggets of wisdom into a book. I can now honestly say that I am living my why. My mission is to add more happiness to this world by creating tools and techniques that help individuals on their journey to lead happier, more fulfilling lives. As a happiness coach I get to help people infuse their life with happiness and become the happiest version of themselves. That, in turn, fuels me. I look back on my time as a Fellow with deep fondness. We still have our meetups where we reflect on our journeys and it is always heartwarming to see how committed this group of leaders is to Miami’s success. What’s more, we’re all passionately living out our why. Rochelle, you certainly have the personality that’s big enough to fuel happiness in the lives of others. You have certainly found your why!